New One Of A Kinds! It is studio clearing time here at DLC Headquarters, consider it an online sample sale, right in time for the holidays! All of the products in this collection are One Of A Kind. So hurry before they sell out! You won't believe how many materials and samples I've acquired over the last ten years of making jewelry for you. It's time to move it out! I'll be selling vintage necklaces, rings, and earrings, as well as components, claps, earring wires, beads and many other things so you can make your own creations. See some examples on the FB invite here. In additon to DLC, there will be other Brooklyn designers, selected vintage, astrology readings and 7 different frozen beverages for your imbibing pleasure. Come hang out with us under the sun this Saturday! Time sure does fly when you are having fun. Please join us this Sunday to toast the last ten years during a sale in our Brooklyn studio. New one-of-a-kind jewelry as well as pieces from past collections for sale at below wholesale costs. Select jewelry materials are also available. We are making room for our next ten years of collections! I definitely find inspiration from many different realms. I own my own business and design several collections every year. I also make music in my home studio, and have several releases (on vinyl!) with my partner Marcos Cabral under the nameTime Reveals. Additionally I work with the Danish designer Henrik Vibskov, buying for the boutique in Soho. I also do Feng Shui consultations and have a small line of Feng Shui inspired home goods. So I am very busy! I try to find my way to a dance floor as much as possible, and when it is nice out, I bike into the city from Brooklyn for some lovely exercise. Finding joy in everything I do is very important to me. If it doesn’t excite and engage me, I won’t do it! EDUCATION SEEMS TO BE A BIG PART OF THE DLC BRAND DNA. CAN YOU TALK TO US A LITTLE BIT ABOUT THIS – HOW HAS THIS SHAPED THE DLC COMMUNITY? Spreading the word on how to create a successful sustainable brand is really important for our future – the more people who follow ethical manufacturing process, the better -for the greater good. I teach several workshops a year, and I also host young designers in my studio to teach them how to build a successful brand. WHAT IS ONE QUESTION YOU WISH PEOPLE ASKED YOU MORE OFTEN? I love working on custom projects for clients. Meaningful gifts for bridal parties, necklaces made from heirlooms – these types of projects are really fun for me. BASED ON YOUR EXPERIENCE, HOW DO YOU THINK NEW YORK FOSTERS THE SUSTAINABLE DESIGN MOVEMENT? There are so many amazing like minded designers here. I am part of a designer Breakfast Club that meets several times a month to discuss owning our own businesses. I find that even though there are a lot of people doing similar things, the community is very supportive instead of competitive. WHAT DOES BEING YOUNG AND ABLE MEAN TO YOU? A movement of eager young designers that are testing the boundaries for what it means to own a label. Manhattan, now it's finally your turn! Susan will be teaching a jewelry making workshop just in time for holiday gift giving inspiration. Bring in jewelry you want to rework, and she will teach you all of the techniques to make new treasures. There will be fun jewelry components to accompany your pieces, jewelry making tools (also available to take home), tea and treats. 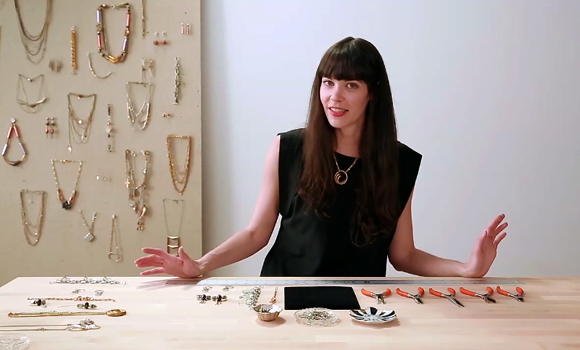 Susan partnered up with Madesmith Academy, a premium online school to help product designers and makers learn sustainable business and creative skills, to bring you five online jewelry courses. 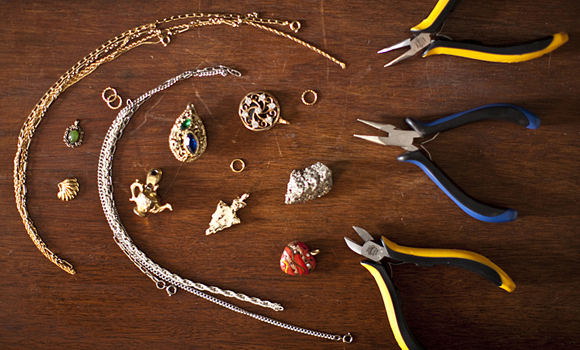 In these courses, she teaches the essentials of jewelry design by repurposing materials from already existing pieces, as well as the importance and environmental impact of using found materials. You will learn how to create two different bracelets, two earrings, or a necklace all featuring repurposed vintage components with easy to follow, step by step video instructions. Madesmith Academy is an online school to help you learn sustainable business strategies + craft skills from top experts who've created successful brands. Get support along the way in our Designer Community. Dirty Librarian Chains designer, Susan Domelsmith, has five courses where she guides you through making a necklace, statement earrings and charm bracelets - you can use your own materials or purchase the kits to make your very own jewelry. Get 10% off when you sign up now using code Launch10. If you have a desk job, but dream about owning a business where you can create and sell beautiful products, Madesmith Academy will teach you the right techniques in the comfort of your own space. Learn to make beautiful Japanese shibori, sustainable jewelry from existing pieces or upcycled kids clothing. All our courses are focused on good design and aesthetic that will inspire you to make gorgeous products. Ariel photographs of Iceland by Emmanuel Coupe-Kalomiris.